The Cleveland Browns were seeking to nail down the NFL Century Division title as they faced the St. Louis Cardinals on December 10, 1967. In the first year in which the Eastern and Western Conferences were broken up into four-team divisions, the Browns were at 8-4 after winning their three previous contests. 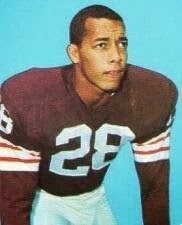 Coached by Blanton Collier, Cleveland had the league’s rushing leader in HB Leroy Kelly, helped by a good veteran line and with a solid backfield partner in FB Ernie Green. 31-year-old QB Frank Ryan was battling assorted injuries but had outstanding receivers in split end Paul Warfield and flanker Gary Collins. The Cardinals, under Head Coach Charley Winner, had gotten off to a fast start but were at 6-5-1 and barely staying alive in the division race. QB Charley Johnson had been called up to military service in the offseason and the untested Jim Hart had taken his place, showing great poise and potential, but also making his share of mistakes due to inexperience. Second-year HB Johnny Roland was right behind Kelly in the rushing race, the receivers were sound, and the defense was good, particularly with CB Pat Fischer and FS Larry Wilson in the backfield. In addition, the Cards had an outstanding placekicker in Jim Bakken. It was an overcast day in St. Louis with 47,782 fans in attendance at Busch Memorial Stadium. They saw a scoreless first quarter with the teams exchanging punts and battling for field position until DB Ben Davis fumbled a Chuck Latourette kick and FB Willis Crenshaw recovered for the Cardinals at the Cleveland 20. In a series that extended into the early part of the second quarter, St. Louis methodically moved down the field and Bakken kicked a 12-yard field goal. Davis (pictured at left) redeemed himself on the ensuing kickoff with a 48-yard return to the St. Louis 41. However, the Browns advanced nine yards in three plays and came up empty when 43-year-old Lou Groza missed a 40-yard field goal attempt. A short series by the Cardinals resulted in a punt that gave the Browns starting field position at their 49. Three plays later, Frank Ryan threw to Paul Warfield for a 38-yard touchdown and, with Groza’s extra point, the visitors were ahead by 7-3. The Cards responded with a nine-play series that went 40 yards. HB Prentice Gautt ran four times for 18 yards and Jim Hart completed two passes. Bakken booted a 42-yard field goal to narrow Cleveland’s margin to a point. The Browns went three-and-out on their next possession, but the punt by Gary Collins was blocked by Larry Wilson and the Cards took over at the Cleveland 25 with 2:15 remaining in the first half. Gautt ran twice for seven yards and, after Hart threw an incomplete pass, Bakken kicked his third field goal, this time from 26 yards. St. Louis held a 9-7 lead at halftime. The third quarter started with Davis returning the kickoff 58 yards to the St. Louis 33. Three plays later, Groza kicked a 33-yard field goal and the Browns were back in front by one. On the next series, a trick play went wrong when TE Jackie Smith took the handoff on an apparent end-around and then threw a pass that was intended for flanker Bobby Joe Conrad but was instead intercepted by CB Erich Barnes. The 10-year veteran returned the pickoff 40 yards to the St. Louis 21. The Browns again had difficulty moving on offense but still put points on the board as Groza kicked a field goal from 23 yards. Down by 13-9, the Cards gained nine yards on three plays and, facing fourth-and-one, lined up for a punt. It was a fake, however, but Latourette lost four yards in his attempt to circle the end and the Browns had the ball at the St. Louis 36. They failed to add points as the offense still couldn’t get on track. Ryan was sacked for a loss of 11 yards by DT Chuck Walker and Cleveland ended up having to punt, although Collins’ kick was able to pin the Cards back at their four. The Browns clung to a four-point lead as the game headed into the fourth quarter. With the Cards deep in their own territory, LB Jim Houston (pictured at top) came through with a big play as he intercepted a Hart pass and returned it 18 yards for a touchdown. Groza’s PAT made it 20-9. The Cards were unable to make much headway on offense and had to punt. They got the ball back in short order, however, when Leroy Kelly fumbled a bobbled handoff on the next play and LB Bill Koman recovered at the Cleveland 17. Hart threw to Smith for a 15-yard touchdown and, with Bakken’s PAT, it was again a four-point game. There were still just under eight minutes remaining in the contest, but the Browns helped themselves with a long, time-consuming series. Ryan had an 11-yard run for a first down, Kelly converted a third-and-one situation with a four-yard carry, and Cleveland was down to the St. Louis 34 before back-to-back completions to Ernie Green lost yards and took the Browns out of field goal range. Still, the clock was down to 1:11 as Collins punted and the Cards found themselves pinned back at their four yard line. Hart (pictured at right) went to the air on every play, but time ran out on St. Louis with the ball at the Cleveland 18 following a 41-yard completion to Smith, who was unable to get out of bounds at the end of the play. The Browns were winners by a final score of 20-16. In a game dominated by the defenses, the Cardinals had more total yards (295 to 131) and first downs (16 to 8) than Cleveland. The Browns were helped by 126 yards on kickoff returns by Ben Davis. Both teams turned the ball over twice. Frank Ryan, who suffered an injury to his left (non-throwing) arm in the first half, completed just 8 of 15 passes for 66 yards and a touchdown with no interceptions. 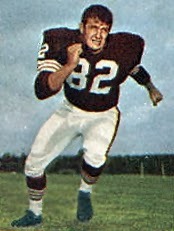 Ernie Green led the club with 48 rushing yards on 12 carries as well as 5 pass receptions, which netted only three yards. Paul Warfield had 57 yards on two pass receptions that included a TD. Leroy Kelly was held to 15 yards on 15 attempts and was credited with the fumble that set up the only St. Louis touchdown. But Ben Davis averaged 42.0 yards on his three kickoff returns and Jim Houston put vital points on the board with his key interception return. For the Cardinals, Jim Hart was successful on 18 of 36 throws for 182 yards and a TD, but also tossed the one big interception. Jackie Smith was the top receiver with 6 catches for 91 yards and a score, although he also threw an interception on his one pass, and Bobby Joe Conrad contributed 5 receptions for 46 yards. Prentice Gautt rushed for 63 yards on 16 attempts. Johnny Roland ran for 27 yards on 12 attempts before he was lost to a knee injury in the third quarter. Jim Bakken was successful on all three of his field goal attempts. “The defense was magnificent, Houston did the job again!” exclaimed Coach Blanton Collier afterward. 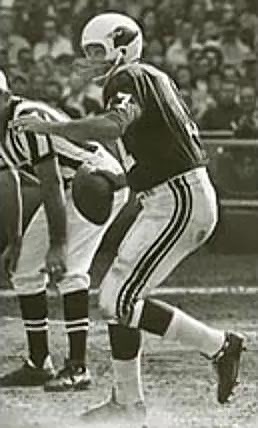 It was the second consecutive week that Jim Houston had scored on an interception. The Browns lost their season finale to finish at 9-5 atop the Century Division but lost badly to the Dallas Cowboys in the Eastern Conference Championship game. St. Louis also dropped the last game to end up third in the division at 6-7-1. Leroy Kelly ended up with the NFL rushing title, gaining 1205 yards while averaging 5.1 yards per carry. Rookie Ben Davis, a 17th-round draft choice, was at his best on kickoff returns against the Cards, but led the league in punt returning with a 12.7 average on 18 runbacks. He ranked seventh with a 26.2 average on 27 kickoff returns.